← What Do You Tolerate to Save Money? When I was 9, my dad, who worked a factory job, was laid off. This was in the 1980s, deep in the recession. He couldn’t find a job for another two years. Money was very, very tight. For the first time in my parents’ lives, they had to rely on food stamps. They were embarrassed to use them, but they didn’t have much choice. After all, they had two children and themselves to feed. I still remember one Thanksgiving during that period of unemployment when our church gave one of the food baskets for the needy to us. I was embarrassed that we were now the needy, but even more so, I was excited by the bounty of food there–a plump turkey and convenience foods like my beloved boxed macaroni and cheese that I hadn’t had for months. Of course, there were plenty of canned fruits and vegetables, too. Food stamps are now called SNAP (Supplemental Nutrition Assistance Program), and they help 47 million Americans (as of 2012), or 1/6th of the American population (Washington Post). While SNAP provides food assistance, relying completely on SNAP for all of your food needs for a month is very difficult, especially considering as of 2013, the average monthly benefit was just $133 (Washington Post). To highlight how difficult it is to live on this small amount, Feeding America invites people to take The SNAP Challenge and try to eat for $4.50 a day, just as someone who is on the SNAP program would need to. A quick perusal of the Internet will turn up the results of many, many bloggers and famous people, including Panera Bread’s founder and CEO, Ron Shaich, who have taken the SNAP challenge, with great difficulty. Of those who take the SNAP challenge, the most common complaint is how difficult it is to buy fresh fruits and veggies as well as meat on such a limited food budget. Instead, they have to rely on carb heavy foods like rice, beans, pasta and potatoes. While everyone knows that SNAP benefits can be redeemed at grocery stores, they can also be redeemed elsewhere. For instance, many farmer’s markets welcome SNAP benefits, and some even offer discounts for SNAP recipients, which is a wonderful thing. However, what I’m guessing that many don’t know is that SNAP benefits can be used to buy seeds to plant vegetables and fruits in a home garden. SNAP benefits can also be used to buy fruit trees. There is an entire Facebook page, SNAP Gardens: Food Stamps Grow Gardens, dedicated to sharing this information as well as a website, Food Stamps Grow Gardens. Sadly, research shows that SNAP benefits rarely last recipients the entire month. “SNAP benefits don’t last most participants the whole month. 90% of SNAP benefits are redeemed by the third week of the month, and 58% of food bank clients currently receiving SNAP benefits turn to food banks for assistance at least 6 months out of the year” (Feeding America). Growing a home garden could be an excellent way for SNAP recipients to extend their benefits and have more food to get them through the month. Of course, planting a garden to stretch SNAP benefits won’t be easy for those who live in urban areas, but even if they live in the city and have a balcony, someone on SNAP can plant some vegetables in containers. They could also plant their vegetables in a community garden space. For someone who lives in a more rural location, imagine how far they could stretch their SNAP benefits by growing their own garden. True, setting aside money from their already meager SNAP benefits is very difficult, but if someone bought one single seed packet for a vegetable that is a mega produce like kale or Swiss chard that continues to grow all season long, even after harvesting some of the vegetable, that person would have a nice supply of greens for several months of the year. Gardening for a SNAP participant as well as for all people, is an excellent way to provide food at a fraction of the cost of buying it at a grocery store. This brought me back to my elementary schools years. Same issue recession, dad laid off, not understanding why things were different. 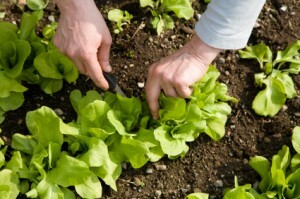 In Los Angeles, and probably other places, gardening classes are available through County Extension, and are offered at a reduced price to low-income residents in urban areas ( http://celosangeles.ucanr.edu/UC_Master_Gardener_Program/Grow_LA_Victory_Garden_Initiative/ ). My husband and I took a class, and it was a fun way to spend our Sunday afternoons together. I think gardening can feel extremely risky if you’ve never done it, so it’s nice to have a little support, because it’s so worth it… not only for the food it provides, but also for the stress-reduction of having a little hobby and the self-esteem that comes with creating something. I’m sure a lot of people didn’t know that you could do this. Great article, but I am sorry for what you and your family went through. That definitely leaves a lasting impression, especially on a child.